Sugar lace or sugarveil has become very popular in the past couple of years. It is an edible product that when applied correctly, resembles fine delicate lace. When it was introduced to the cake decorating field it became an instant success. It is a favorite among cake decorating professionals because it adds such a beautiful effect on cakes cookies and cupcakes. I just love the vintage look and I use it in so many of my orders. Best thing is, it’s so easy! So you don’t have to be a seasoned cake decorator to use it. Sugar lace can be purchased at baking specialty stores. It comes in either a powder which is later mixed with water, or a ready made gooie paste. I recommend the ready made paste. Less room for failure . There are recipes out there to make your own but I would suggest getting used to the store bought one before experimenting with glycerin, gelatin, glucose and tylose powder! The downside of sugar lace is that it requires a thin silicone mold which can be quite costly. There are smaller ones such as these to get you started. It can be spread and then peeled from the silicone mold and draped around the contours of a cake or placed on top of your fondant cupcakes or cookies. These pieces may be made in advance, stored air-tight to retain their flexibility, and used when desired. Lay the silicone mold on an even, dry surface. If you purchased white sugar lace you may color it with food coloring. I recommend using a gel based color. Add a TINY drop of color and mix well. Continue adding a little bit at a time until you reached the desired color. Spoon the sugar lace into the mold. You will be surprised at how little you’ll need. Using your finger spread the paste into the mold. Make sure to use pressure while spreading so it reaches the very bottom of the mold otherwise the lace will come out cracked and uneven. 4. Once the silicone mold is filled with the sugar lace paste, use the flat side of the metal comb or back of the knife to scrape off all the excess. Make sure to remove as much as possible. This will make it easier to peel the lace out when dry. 5. Let the lace air dry uncovered. Drying times will be different with various temps and humidity and different sized molds. I usually let mine sit for a minimum of 5 hours. Although I recommend drying it over night to be safe. You may place it in the oven at 70C for about 10 to 15 mins. But you have to be careful, if you leave it longer or at high temperature the lace will become too brittle. It may also dry unevenly. 6. When the lace is dry, bend the mold back and gently peel the lace out. If the lace is ready it will release itself easily. If its still sticky and it begins to tear it needs a couple more hours of drying time. Dab a little water on the cake/cupcake/cookie. 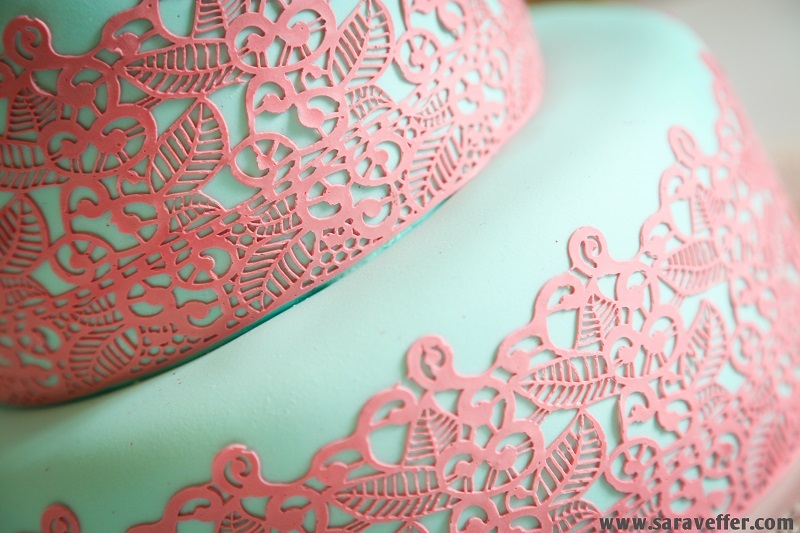 The lace best adheres to a fondant surface. If you are putting it on buttercream or icing you can skip the water. For added effect I sometimes dust the lace with edible dust using a thin brush once its removed from the mold. Here is an example of cupcakes I topped with a piece of lace. You can store the ready made lace wrapped individually in between parchment paper in a ziploc or air tight bag unrefrigerated for up to a month. Where is a good store in yerushalayim to go to that would have these items to purchase ?